With the transition from one calendar year to the next, people commonly make resolutions to improve their health, well-being, organizational skills, time management and more. But it’s as good a time as any to reflect on how to make improvements in business as well, whether it’s around a specific position or for the company as a whole. For commercial fleets, this year is a great time to finally get a grasp on metrics and aim to become a best-in-class fleet. This past year, we published our 2018 Verizon Connect Fleet Technology Trends Report, based on a survey of field service companies conducted by Verizon Connect and Bobit Business Media, incorporating the knowledge we’ve gained by virtue of millions of data points from hundreds of thousands of connected commercial vehicles moving across our network every day. But simply realizing these benefits doesn’t make a fleet “best-in-class.” That’s because best-in-class has to do with how well companies, fleet managers and the fleets themselves utilize these benefits, and others, once they realize them. And specifically, that means looking closely at how organizations use technology to manage idle time and stops per hour. There are laggard performers, average performers and best-in-class performers. Where your organization falls on this spectrum impacts how well prepared your fleet is to excel in 2019 and beyond. Knowing and understanding specific benchmarks can help your company, and fleet, learn how to power down the path toward best-in-class status (if you’re not already there). That’s why we’re highlighting the specifics behind idle time and stops per hour. This is where fleet management technology comes in. No matter the industry, successfully leveraging data-driven telematics solutions can have a positive impact on idling hours, with a clear difference for best-in-class organizations. Again, as with idling, this is where fleet management technology makes a difference. Across industries, there is again a definite leg up for best-in-class organizations making the most of telematics solutions. New Year’s resolutions are often about creating better versions of ourselves. For fleets, that means doing everything you can to stay competitive and future-ready. Investing in, or upgrading, fleet management technology is a great place to start. 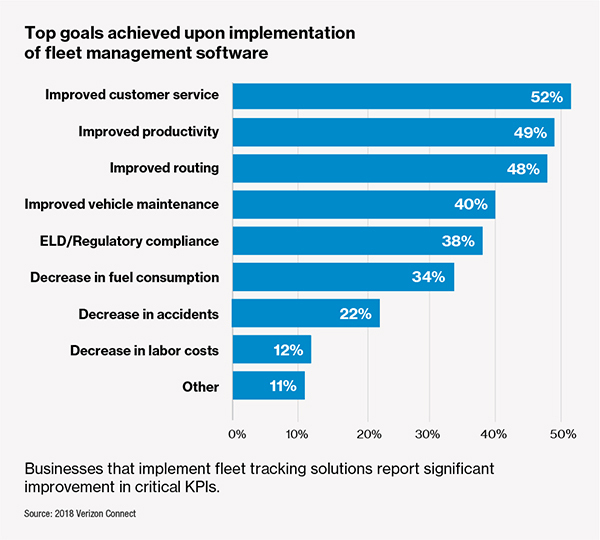 Not only can fleet management software help improve critical benchmarks involved with reaching a best-in-class status, the software can also help all fleets realize improvements across many critical KPIs. Verizon Connect's top-ranked fleet management technology can help you make steps toward future-proofing your business and becoming the best fleet it can be. You can also learn from others who have gone before you, like Witmer’s Feed and Grain which is using fleet management software to gain ground on becoming a best-in-class fleet.